Teddy had been around for a long time. He was one of the squeaky toys that got pretty chewed but never tore up. I think he was around for about a year. 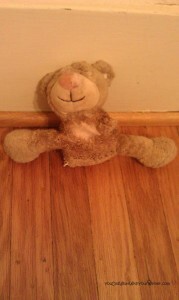 Along the way, Teddy suffered some injuries. He always managed to keep a good attitude. He was quieter though since his squeaker just gave out. Teddy was a good ol’ guy. He grew up hanging out with the Simply Fido Organic Plush Toy crowd. This guy was not full of your regular fluff. His heart was made of pure organic cotton. This selfless little guy cared about the health of Chester and Gretel, farmers and the planet. The other day something went terribly wrong. I found teddy on the couch with his guts hanging out. I examined him but there were several jagged cuts. It didn’t look like stitches would have put him back together again. I sent Teddy to the big stainless steel cylinder in the kitchen without much fanfare. I must confess, I may have had some involvement in his demise. The one who did Teddy in didn’t even try to deny it or apologize. Poor Teddy. In all actuality, I think he gave up. He knew his days were numbered when the new kids arrived on Christmas morning. This is a blog hop. Visit our pal Snoopy’s blog to check out the other pet blogs sharing their mischief stories. Good By Teddy–You served you’re ‘owner’ well! RIP! Oh poor Teddy – RIP little guy! RIP Teddy, in with the new and out with old. No such thing as loyalty when it comes to stuffies. Have a marvelous Monday now. Oh my! I can’t imagine sleeping at night without Bunny in my bed with me! I hope mom can keep repairing him at her “stuffy hospital”. Sorry for your loss, RIP, Teddy! I love hearing those noises! Aww, poor teddy. We have sent our share of toys to toy heaven. 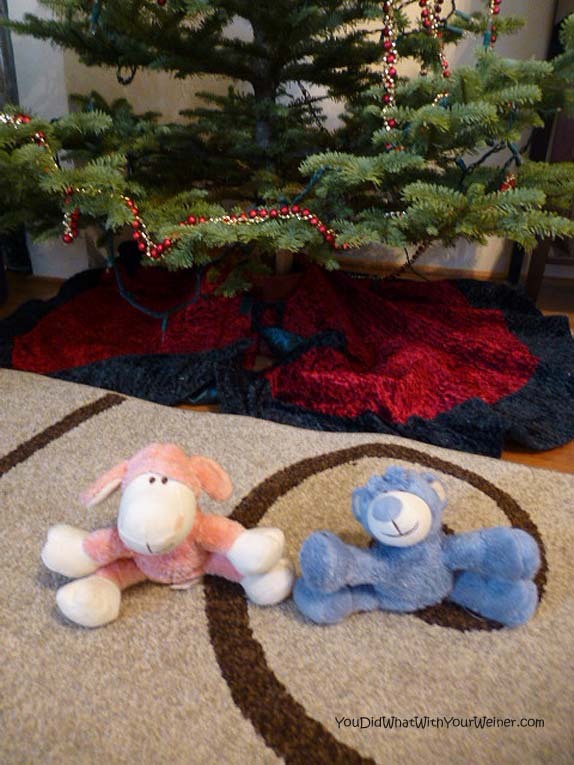 Wow, I can’t imagine a Stuffy in our house lasting more than a hour, organic or not…LOL! Although we gave Frankie a big, long Reindeer Stuffy with 16 squeakers in it for Christmas that lasted most of the day before it was destuffed and desqueaked! The good thing is that he will still play with the remnants until he has it into shreds, then it goes in our stuffy graveyard, RIP!!! Poor Teddy, I’m sure he will rest in pieces. RIP, Teddy – those who come after you may live up to your name but not reputation. The look on Gretel’s face is priceless “I did it and I’m not sorry!”. Stuffies don’t last here; heck, stuffed beds don’t last here. My large heavy duty beds last plus a mattress locally made and covered with a Molly Mutts cover but otherwise – tossing stuffing is part of daily cleaning. Sigh. Poor Teddy, sounds like he had a good life BOL! My 4 go first for the squeaker and then the stuffing on toys. So we switched to the stuffingless toys and I watch them get the squeaker out and then send it to the “cylinder” in the kitchen! O i don’t like the idea of him giving up, as you would have loved him even with the new gutys! How have the new guys settled in? One of my christmas toys is already on the high shelf waiting a trip to the nurse for some sutures! Oh poor Teddy! Good thing for replacements. Aw. 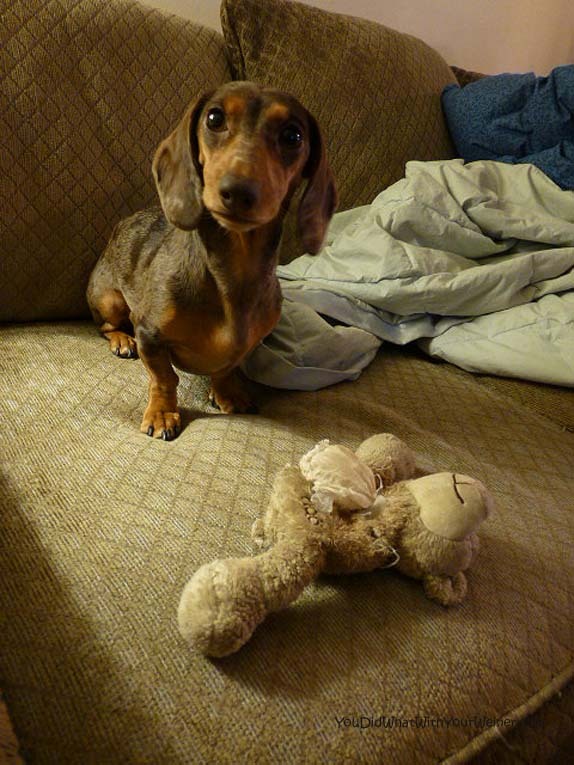 My childhood dog Scotti had a teddy bear she carried around for years. 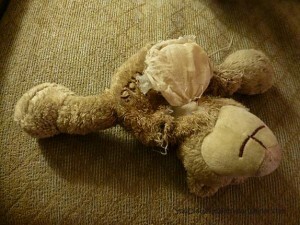 We kept doing surgery on him and he eventually looked like Teddy – no arms and lots of holes.